I've been working non-stop on this Unhinged product for three days (except for the times I actually had to, you know, go to work), so I'm incredibly pleased and proud to have finished it! It's a light. It's a floating skull. It's a bit weird, and it's mod - so, even though I haven't tried it yet, I'm pretty sure you could wear it as a mask, and if you want to look extra-weird, alpha your avatar out and appear as a floating skull to every one around you. That'd be a bit freaky, though! Another stupid trick is to turn the eyes transparent and stare at the world from the inside of the skull. Useless, I know, but I've had fun doing that while testing it on my local OpenSim. I'm easily amused! Anyway! Touch it to turn the light on/off (owner only), or mod the script inside to make it sing a lullaby. 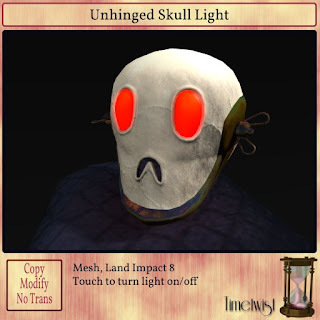 You can see it inworld and buy it at Timetwist, and you can also buy it at Unhinged. You should buy it at Unhinged, anyway. So much cool stuff around!